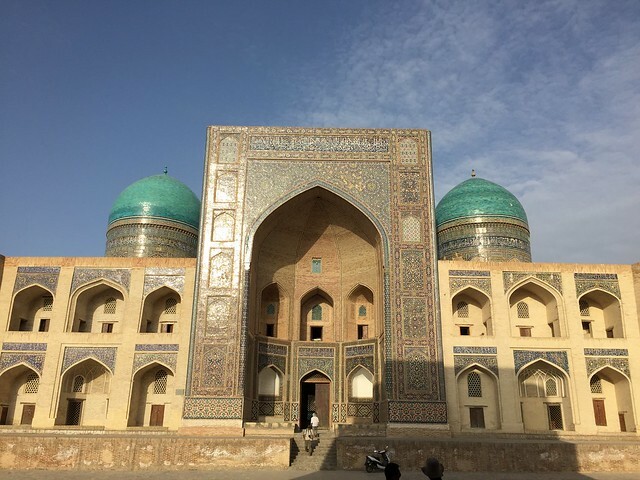 Uzbekistan is nominally a Muslim state but the religion here is not as strict as in the Arab world or even the Russian Caucaus region. However, the taxi drivers still try to pray five times a day even behind the wheel, and they manage to do this without even stopping the car. Makes you want to pray to God that you stay safe, too. After surviving 6 hours in the sweltering heat of a taxi **Bukhara** seems to be a paradise. Until a century ago the city was watered by a network of canals and some 200 stone pools. Since the water wasn’t changed often, it caused plague and other diseases; the average 19th-century Bukharan died at the age of 32. The Bolsheviks modernised the system and drained all the pools but the most famous one – **Lyabi-Hauz** – still remains a cool oasis in the heart of the city. 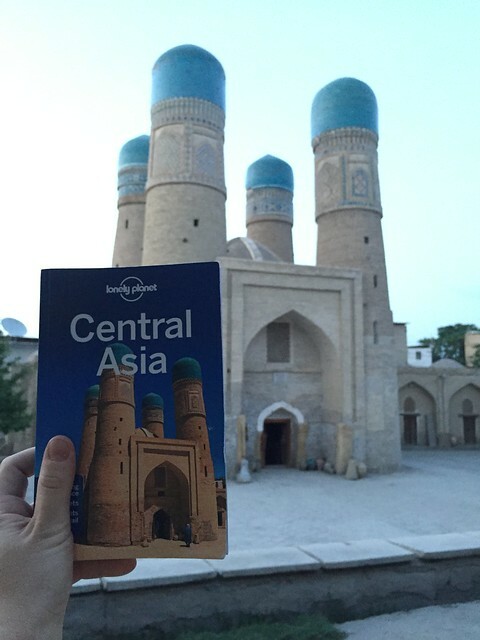 **Bukhara**, Central Asia’s holiest city, traces its history some 2500 years back. It was as capital of the Samanid state in the 9th and 10th centuries that Bukhara blossomed as the center of religious and cultural life. Among those who lived and worked here were the historian [Narshakhi](https://en.wikipedia.org/wiki/Narshakhi), the poet [Rudaki](https://en.wikipedia.org/wiki/Rudaki) and the philosopher-scientist [Ibn Sina](https://en.wikipedia.org/wiki/Avicenna). 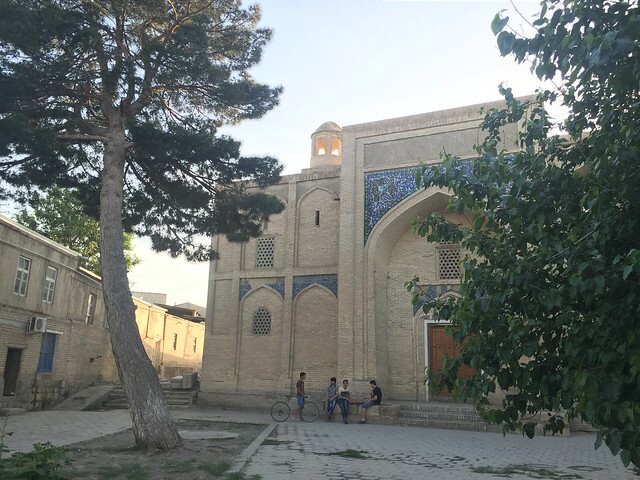 During the glorious 16th century the Uzbek Shaybanids made Bukhara the capital of what came to be known as **the Bukhara khanate**, and hundreds of new mosques, medresas and bazaars were built in the city, adding to Bukhara’s charm and fascination. The medresas and mosques are so many you easily lose count. 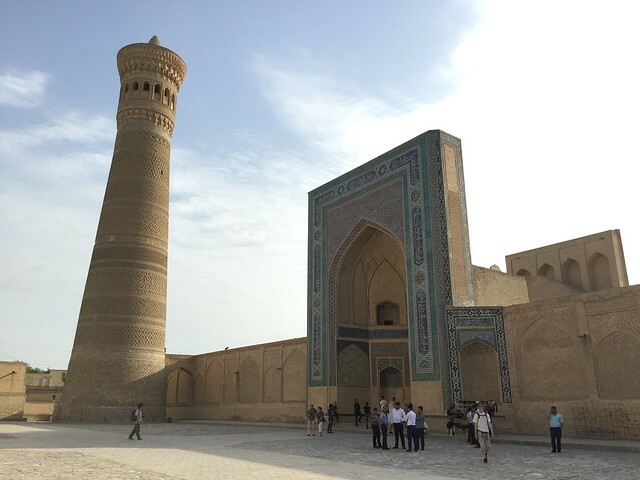 Among the most remarkable ones is **the Kalon mosque** with the famous **Kalon minaret** that was built in 1127 by the Karakhanid ruler Arslan Khan and at that time was probably the tallest building in Central Asia. It rises 47 meters up; its 12 ornamental bands, all different, include the first use of the blue tiles that later on became so tipical for the region. According to the [book](http://shop.lonelyplanet.com/asia/central-asia-travel-guide-6/), a legend says that Arslan Khan killed an imam after a quarrel. That night in a dream the imam told him, ‘You have killed me; now oblige me by laying my head on a spot where nobody can tread’, and the tower was built over his grave. Opposite the Kalon mosque is the working **Mir-i-Arab Medresa**, with its luminous blue domes in contrast with the surrounding brown. It took its name from its founder – a 16th century Naqshbandi sheikh from Yemen (“mir-i-arab” means “the property of an Arab”). From Shaybanid times, the area north and west from Lyabi-Hauz was covered by the market lanes, arcades and minibazaars. Three remaining domed bazaars were among dozens of specialized bazaars in town – **Taki-Sarrafon**, **Taki-Telpak** and **Taki-Zargaron**. 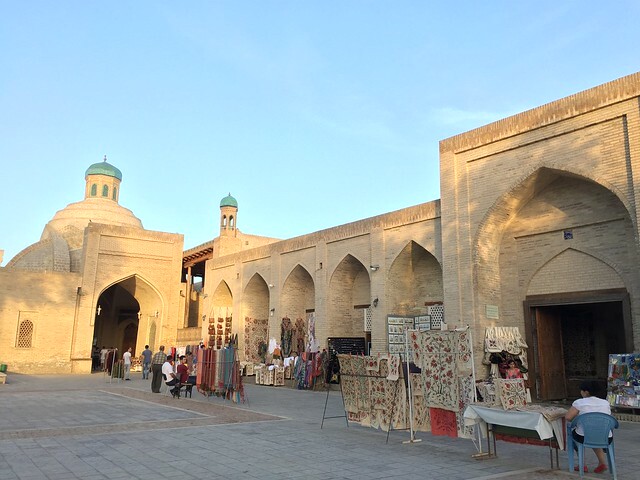 However fascinating and breath-taking the old famed medresas and bazaars might be, it is the atmosphere of the place that attracts the visitors and makes them want to stay in Bukhara longer than anywhere else in Uzbekistan. Stroll its streets, and you are sure to bump into its hidden gems that are scattered all over place. The photogenic small **Char Minar** makes you think of India rather than Bukhara. This was the entrance to a long-gone medresa built in 1807. The name means “Four minarets”, although they are not strictly speaking minarets but rather just decorative towers. 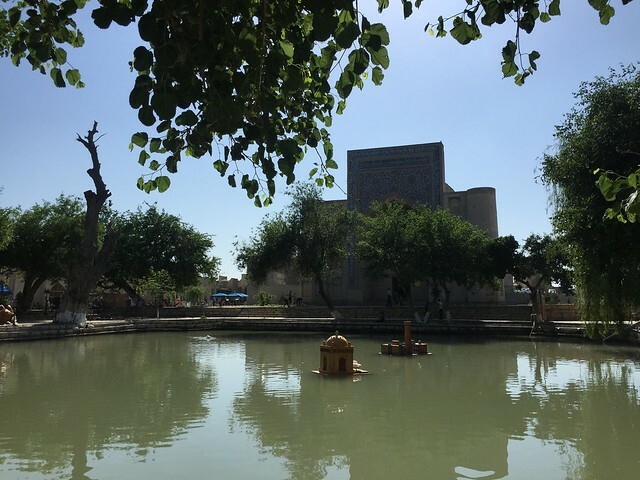 Get off the beaten track, and you will find the perfect quietness of the Modari Khan and Abdula Khan medresas where no tourists are ever to be found. 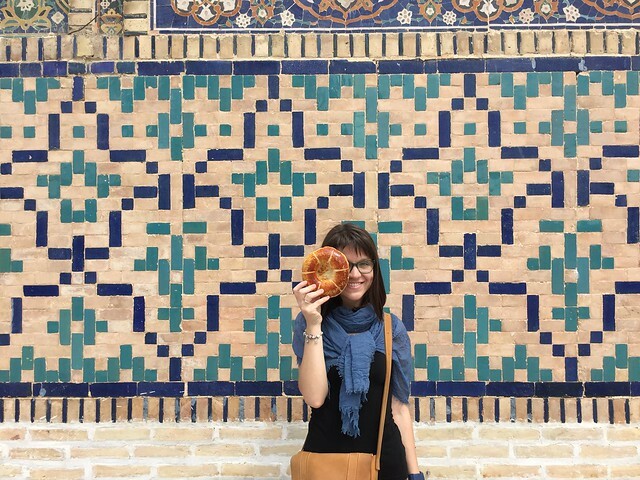 Grab some fresh bread at the Shahristan market opposite the Kalon mosque and take some pictures with the blue tiles of Mir-i-Arab medresa, imagining yourself somewhere in Yemen. 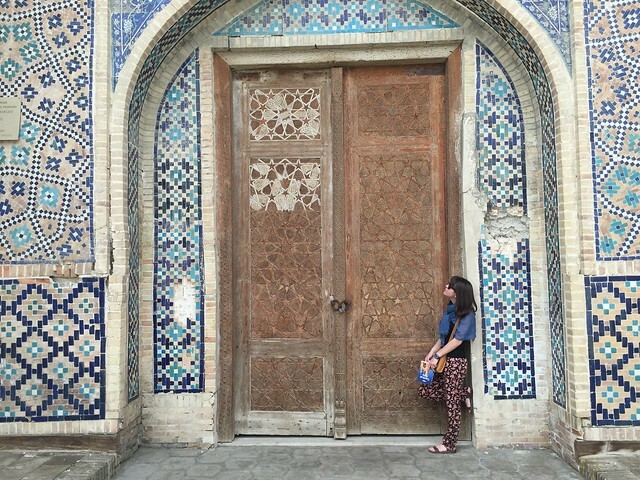 Get lost in the old town and discover the secret places of Bukhara – a city that never fails to impress its visitors. My name is Olga, and I am based in St. Petersburg, Russia. Globetrotter, peanut butter lover. Visited 51 countries so far and counting! 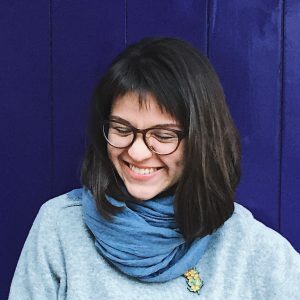 Favourites: Iceland, Scotland, Kamchatka.